And he urged us to look to the Earth as our primary source of divine revelation. Berry’s words became real for me when I moved back to my Chesapeake Bay homeland after an absence of some 40 years, most of which had been spent searching for God in all the ways they tell us God can be found: in scripture, in liturgy, in prayer, and in various forms of religious community, including several stints in monasteries. But it wasn’t until I returned to the landscape of my childhood that I truly fell in love with God through, with, and in the place I now call beloved. Nor am I content to confine this passion to merely human experience. No. I need to see God in and through every eye. For instance, how do oysters experience their yearning for the divine? How would the reciprocity of this relationship express itself for them? Participants in the Chesapeake Bay Program's Forestry Workgroup Smith Island Trip sort through a muddy pile of oysters dredged from the waters of Smith Island, Maryland. Image by Chesapeake Bay Program/Flickr (CC BY-NC 2.0)..
“The Reef” embodies a desire for that ineffable “something more,” which is shared by all inhabitants of the universe. If we humans know nothing else, we know there is much we need to let go of in order to be open and available to divine presence. We read in scripture that the grain of wheat must die to produce fruit. How, I wondered, might a tree experience the diminishments of the aging process, how would it move through its suffering to know the numinous “something more” we all hope for? I found my answer on the beach one day. Partners of the Chesapeake Bay Program Forestry Workgroup explored the down-Bay environment of Smith Island to see the impact of their restoration efforts. The visitors hauled up their own crab pots, sorted oysters on the water and experienced life in the Smith Island communities of Tylerton, Ewell and Rhodes Point. Image by Chesapeake Bay Program/Flickr (CC BY-NC 2.0).. I felt it, a surge within. Instead of saying, “Azimuth of Venus at 45 degrees,” perhaps we could learn to say, “Azimuth of God at the oyster reef,” or “Azimuth of God at the oak tree” as well as “Azimuth of God at John and Jean.” For if there’s anything a passion for place has taught me, it’s that spirit intersects matter everywhere. A fisherman casts his net on Chesapeake Bay near Lynnhaven Inlet, Virginia Beach, VA just before sunrise. Image by Jim Brickett/Flickr (CC BY-NC-SA 2.0). 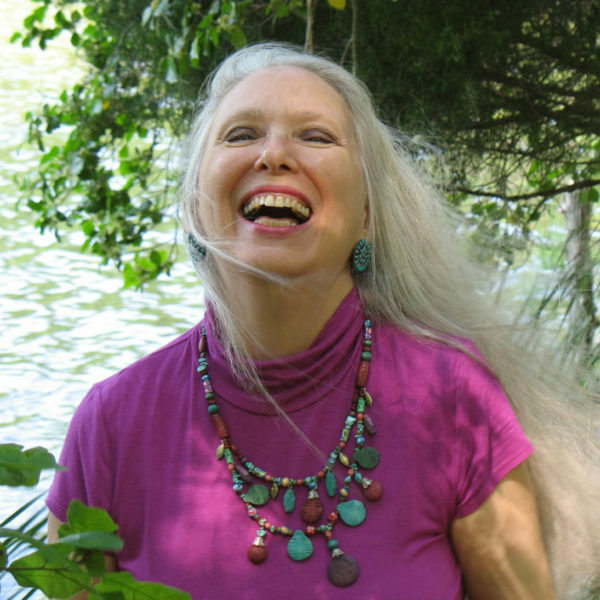 Elizabeth Ayres is the author of Mirror of Our Becoming: Meditations on Nature’s Beauty, Wisdom & Mystery and three other books. She’s the founder of the Elizabeth Ayres Center for Creative Writing, which has provided inspiration and support to aspiring writers for 25 years. She lives in Maryland’s Chesapeake Bay area, where she paces shell-strewn beaches to pluck words from the soft salt breeze. She is currently working on a new book, Azimuth of God: poems of absence and presence. With Gerard Manley Hopkins as his guide, Parker reflects on the sacredness and beauty of life and difference.